Emerging from decades of being behind the Iron Curtain and within a closed economic system, Poland lagged significantly behind its western peers in pediatric medical care. Access to the latest treatment techniques and medical know how from beyond its borders had been extremely limited, and there was almost no active international knowledge sharing among doctors. Those who suffered the most were children. In 1979 two colleagues of the Polish Association of Pediatric Surgeons visited Los Angeles with the aim of formalizing a medical exchange between the UCLA School of Medicine, the Medical Academy of Warsaw and Children’s Memorial Hospital in Warsaw. After early difficulties finding funding to launch their ambitious endeavor, they were put in touch with a prominent Los Angeles-based radiologist of Polish ancestry named Dr. Stefan P. Wilk, who agreed to assist. Within months, operating initially with patronage from the local Parish church, and later under the auspices of UCLA, the Children’s Medical Care Program (CMCP) was formed. CMCP’s initial objective was to bring carefully selected Polish physician to UCLA for intensive supplemental training visits, later called fellowships, to greatly improve their ability to administer renal care. Chronic kidney disease was a relatively common problem among Polish children. Additionally, the nation suffered from an extreme shortage of dialysis machines. In April of the following year the first two physician-scholars arrived at UCLA for specialized training at UCLA’s world-leading Pediatric Nephrology Department. Among the treatment methods they were exposed to at UCLA was a new form of portable kidney treatment called Continuous Ambulatory Peritoneal Dialysis or CAPD. This life-extending treatment could be administered anywhere, making it an ideal short-term solution for a nation that could then only offer dialysis to one out of seven who needed it. Upon return to Poland, with guidance from the recently trained fellows, the Ministry of Health embraced the technique, making a special allocation for its wide application throughout the country, and establishing a training center for it at the Academy of Medicine, Warsaw. Meanwhile, back in the US, Polish physicians continued to be trained in the range of specialties required for the longer term goal of kidney transplantation, including immunology, anesthesiology, surgery and critical care nursing. By 1984, a sufficient range of specialized medical expertise had been acquired to comprise a transplant team, and on June 8th of that year, with support from a team of UCLA physicians, and a donor organ from Germany, the first ever Polish pediatric kidney transplant was performed on an 8-year old girl in Warsaw. CMCP’s accomplishments during the nineteen eighties were remarkable. Many successful transplant procedures followed, with a center being set up for that purpose at the Children’s Memorial Health Institute headed by a former CMCF fellow. Academic centers in the cities of Gdansk and Poznan were added to the medical exchange and significant improvements to the quality of health care delivery were realized across Poland, including and many medical ”firsts”. In 1985, on a visit to California, a Polish neonatologist named Professor Janusz Gadzinowski met CMCP’s founder and convinced him to take on the challenge of newborn care. At that time, care of Polish neonates was considered to be twenty years behind the US. Most newborns were delivered in obstetrical hospitals and neonatology was not yet a recognized medical specialty, factors contributing to Poland’s alarmingly high infant mortality rate of 25 deaths per 1000 live births, the second highest in all of Europe. This problem was different in scope from chronic renal disease, and would involve organization of care for an entire nation. 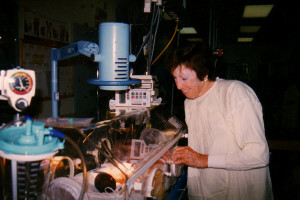 It was at around this time that Professor Joan Hodgman, a pioneering USC Neonatologist now known as the ‘Mother of Modern Neonatology’ joined CMCF’s Board of Directors. With the help of another world renowned UCLA-based pediatrician, Professor Michael P. Sherman, Dr. Hodgman set to work assessing the level of newborn care throughout Poland and developing a plan for how to improve it. In 1986, an extensive, coordinated educational program in neonatal care was launched with the First Polish-American Seminar on Neonatology in Poznan. A plan was also put in place to broaden CMCP’s medical exchange to include a wider range of western teaching hospitals recognized as leaders in the subspecialties most pertinent to the care of neonates. To permit partnership with institutions beyond UCLA, and to provide increased fundraising flexibility, later that year CMCP applied for and was granted its own tax-exempt status as a California Nonprofit Public Benefit Corporation, changing it’s name in the process to the Children’s Medical Care Foundation (CMCF). Meanwhile in Poland, Along with putting into practice-and sharing with colleagues-what they had learned former CMCF Fellows were beginning to emerge as leaders in their respective fields of treatment. Following on the successes of the kidney transplantation program, Professor Piotr Kalincinski, initiated a program specializing in liver transplantation and led the team that performed the first liver transplant in the history of Poland. Hundreds of successful liver transplants have occurred under his leadership since. In February of 1991, an East Coast chapter of CMCF was formed under the chairmanship of a Polish-American pediatric surgeon named Dr. Maria Niemerska. With funds raised primarily through cultural events in New York City, and a new partnership with Columbia University Babies Hospital in New York, fellowships began to be made available in the specialties of neonatal intensive care, pediatric and cardiac surgery. Dr. Jolanta Cholon, was subsequently elected Chairwoman of the East Coast Committee, and began to focus her efforts on expanding training opportunities to other leading medical universities up and down the East Coast. In the early nineties, possibly relating to the after effects of the Chernobyl nuclear disaster, the greatest cause of child mortality in Poland was cancer. Approximately twelve thousand new cancer cases were being reported there annually. In response, CMCF decided to make pediatric oncology one of its primary objectives of help. Treatment of malignant tumors, particularly bone marrow transplantation, was not well developed in Poland. Dr. Cholon, and Prof. Jerzy Kowalczyk, a pediatric cancer specialist from Lublin, initiated a new CMCF program in oncology. Physician-scholars specializing in cancer care would now be trained at Columbia Medical School, St. Jude’s Children’s Research Hospital and other leading oncology research and treatment centers throughout the US. In 1993, Dr. Wilk contacted the The California Association to Aid Ukraine (CAAU) with the idea of creating a joint project in Western Ukraine aimed at helping that nation’s children. At CAAU, Dr. Wilk met an emergency physician from nearby Ventura named Dr. Jerry Maryniuk. Of Ukrainian heritage, Dr. Maryniuk knew well the conditions that existed in that nation and shared Wilk’s enthusiasm for doing what he could to improve them. The next year, Dr. Maryniuk and Professor Hodgman visited Lviv, Ukraine to evaluate the needs of physicians and lay the groundwork for a new type of CMCF fellowship. With co-sponsorship from CAAU, this new program, “Help the Children of Lviv”, would see doctors from that city, many of whom spoke Polish but little English, receive supplemental training in Poland administered by former CMCF fellows, many of whom now managed key pediatric medical departments in Poland that were beginning to distinguish themselves for their exceptional level of care and training. Initially, three medical centers in the cities of Poznan, Krakow and Warsaw were selected as training sites for this Centers for Excellence program. CMCF and CAAU also came together to fund travel of Ukrainian physicians to Neonatology conferences in Poland, a visiting professor program and assisting in the translation and publication of a pediatric handbook, Handbook on Neonatal Resuscitation. Upon return from a trip to Lithuania, the land of his birth, Bjoern Martinoff, CMCF’s president since Dr. Wilk’s passing in 2008, urged the Board of Directors to consider broadening the medical exchange once more. A needs assessment visit by Drs. Hodgman and Sardesai a year later led to partnerships and the exchange of physician/scholars with two hospitals in Latvia, and three others in Lithuania. As western treatment approaches and medical thinking has evolved, so have CMCF’s methods and emphases. Among the innovations CMCF has introduced into Eastern European medical thinking recently is a widened view of who among the caregiving community should receive specialized training. CMCF has begun training nurses and other allied health personnel, and has developed a specialized observership whose focus is improving teamwork involved in medical caregiving. In 2013, for the first time in its history, CMCF’s expertise sharing opportunities extended beyond the boundaries of Eastern Europe. In june of that year, Dr. Raid Umran, an Iraqi pediatrician, received advanced supplemental training in the department of Dr. Smeeta Sardesai at the prestigious USC Keck School of Medicine. In 2013, CMCF partnered with Karpiel Consulting and the City of Lviv to fund the planning phase of the first-of-its-kind Pediatric Emergency and Trauma Center in all of Ukraine. This state-of-the-art center will be the most advanced in the region. From the beginning, Dr. Wilk insisted that knowledge-sharing be CMCF’s main aim. He had seen modern medical equipment, donated with the best of intentions, sitting unused in Polish hospital wards because staff lacked the expertise to operate it. But his conviction went deeper. Dr. Wilk believed that helping Polish physicians to help themselves was the most effective way to create lasting, systemic change. Sharing the best of what is known-across borders, and between cultures, builds bridges, and breaks down barriers, and would, over time, foster an ethic of care giving excellence.